Big news: we now have a dining room table! 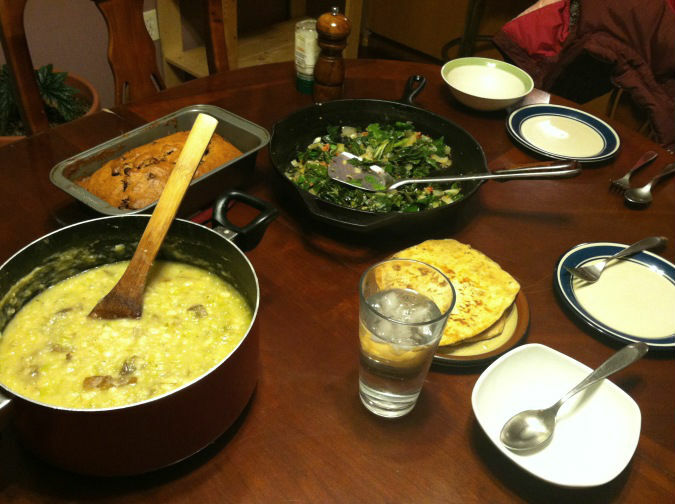 I got to break it in for its very first meal last Sunday night, when I had some friends over for dinner. And then again this week, when I whipped up this delicious meal, while Jesse geeked out on his new bike, trying to find the perfect orientation for his homemade pannier stereo, in preparation for Elizabeth’s Dirty 30 Fancy Cocktail Hopping Bike Extravaganza that we embarked on Wednesday night, with a crew of about 30 of our friends. Note: I do know the correct pronunciation of “pannier,” but have Americanized it for the sake of convenience. I get a lot of crap whenever I pronounce it like I’m Canadian. Really, this soup was so simple, I don’t think I even remembered to take a picture. I had started some white beans soaking earlier in the afternoon after coming home from some errands (and discovering The Portland Fruit Company, OMG!! And way to go on the domain name score, btw), which I boiled while getting the base going. 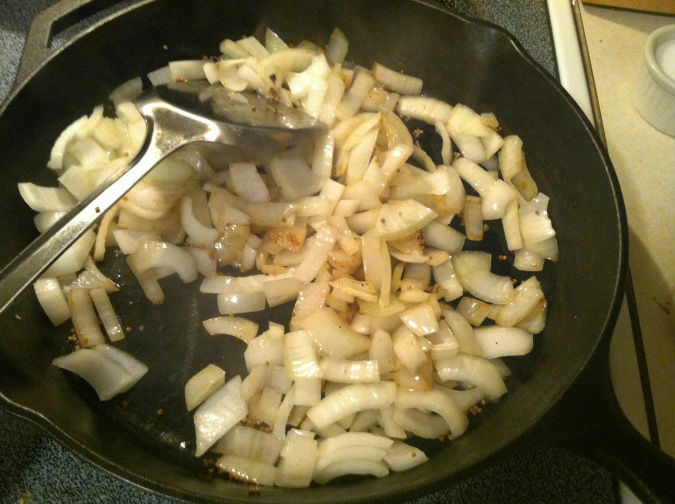 This entailed chopping some leeks, and sauteeing those in some olive oil, along with a few cloves of pressed garlic, some salt, a diced Hatch chile, and coriander. Then I added some russet potatoes, diced into 2″ chunks, some chicken stock and water, and some fennel seeds, and let this all cook together (adding the beans once they were nearly cooked) until all the ingredients were nice and soft. I was totally not up for getting the blender dirty (and I’m pretty sure the rubber ring has somehow gotten stuck in the garbage disposal) so I just used a potato masher to half-puree the soup right there in the pot, giving it a nice milky consistency but leaving enough chunks of veggies so it wasn’t too smooth. I was going to add some milk or cream but really, it was rich enough without it. 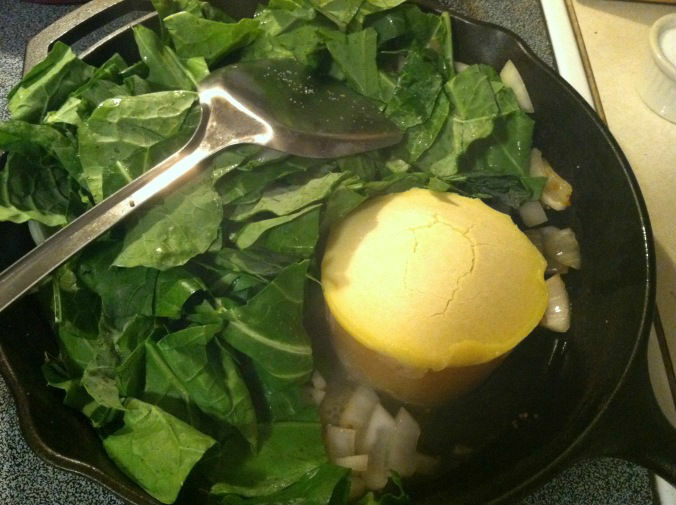 I had just bought a gargantuan bunch of collard greens and was stoked to get to use them. 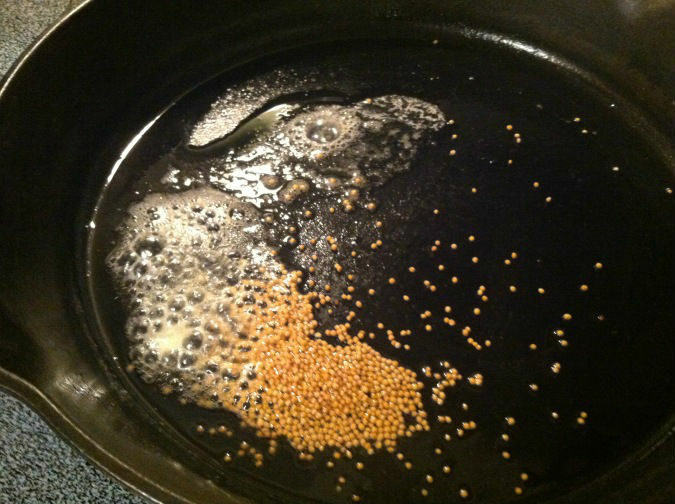 First, some oil and butter in the skillet, and a tablsepoon or so of mustard seeds, cooking them until they started to pop. And then the entire head of greens, chopped, while I melted an inch’s worth of chicken stock off of the cube I keep in the freezer. Once the greens were bright and just wilted enough, I threw in a few tablespoons of apple cider vinegar and salt to finish it off, rolled out some flatbread dough that I’ve been keeping in the fridge, and fried that up in a little bit of olive oil. Oh yes, and I also made chocolate chip banana bread out of some bananas that were taking up too much room in the freezer!